Too often, businesses hire a moving company that is not qualified to help with their office relocation. Commercial office moves are a specialized service. 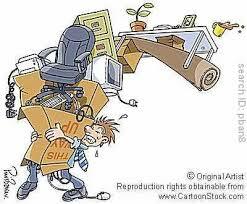 The same company that helped you move into your new home may not be qualified to help you move into your new office. As a general rule, office tenants should retain an experienced, local moving company that specializes in office relocations. Ask your tenant representation commercial real estate broker for recommend several companies which have worked well for his previous clients. Below are some rules to help guide the selection of your mover. Contact moving companies as soon as you have determined your new location. Ideally, you should have your first meeting with prospective movers 5 months out from the move date (at this point you should already have the lease signed). It’s important to schedule a moving day far in advance because most leases terminate at the end of the month, making these days difficult to schedule with commercial movers. By starting the process early, you also allow yourself more flexibility to adapt when surprises occur (as they tend to do in the moving process). Share consistent information with all potential moving companies regarding the scope of work so that you receive comparable bids and can make an apples-to-apples comparison. Beware that some companies may underestimate their bid to win the contract. Compare the proposed amount of man-hours in each bid, and make sure they are similar. It is important to get a bid before hiring a company, but remember that sometimes the lowest bid is not the best choice. Many moving companies experience rapid turnover in employees, so it is important to check references that are current. Ask each prospective moving company for 3 or more references from clients that hired the company within the last year. Ask the references if the movers were cooperative and careful, and how close the final price was to the original estimate. Though this is an obvious and important guideline, office tenants often neglect to follow it. Your ideal moving company will have experience moving other businesses similar to yours, as well as experience moving companies out of your current location and to your new location. At the very least, make sure to hire a commercial mover (NOT a residential mover) who has experience in your property type and market. Here’s an example that’s common for office tenants. Some moving companies are not equipped to move computers and other sophisticated office equipment (copiers, printers, scanners, etc). Ask your IT consultant and/or vendor if they are comfortable with using a moving company to relocate the equipment. If so, determine which prospective movers have the experience and ability to move the equipment. Many moving companies hire mostly temporary personnel. These temporary workers have higher turnover and less experience compared to permanent employees. If possible, do not use a mover who will assign temporary help to your account. Insist that all moving company personnel working on your account are experienced employees. Favor the company that will assign you the most experienced workers. Whenever a moving question arises, or another question relating to your office space, you should contact your tenant representation commercial real estate broker. Whatever your problem, chances are he has helped another client solve it before. For more on the benefits of tenant representation, click here. For more information about planning an office relocation, click here or contact Troy Golden at troy@goldengroupcre.com or (630) 805-2463. Great post from The Oak Brook Office Report! I like your advice about checking current references when hiring a moving company. I can get a better idea of what a company is like from other people, especially people I trust. Are most moving companies willing to give out a list of their clients?